Dice & Mystics Fringe on October 27th – Need a Taxi? special offer for taxi rides to or from the Dice & Mystics Fringe: 10 % off all fares outside Bochum! In order to use this special offer, contact one of the numbers below or send a mail and state that you are a guest at the “Dice & Mystics Fringe” event. 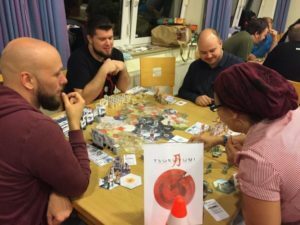 The Dice & Mystics Fringe event on Sat. 27th Oct. 2018 is booked full! We are very much looking forward to seeing you wonderful people in October. With over 80 % returners from previous years it is going to be a happy reunion for many. Like last year, anybody who is late but is still wanting to join in the fun is from now on going to be put on our waiting list. If you are booked but can for whatever reason not attend, do give us a shout so that somebody else can have a chance to take your place. Thank you so much! 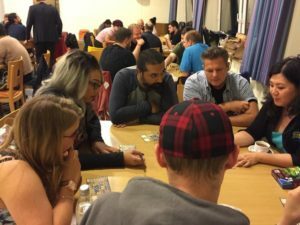 Going to Essen and want to play? Yes, we’re doing it AGAIN! How could we not, after all the positive vibes, the fun and happiness we experienced at our previous Fringes? from 4.00 p.m. to midnight. However, the places are limited, so we do kindly ask you to contact us so that we can put you on our guest list. We can give you directions on how to find us (by car just 3 turns from the autobahn; also by public transport). Hotels and restaurants in the vicinity may be about the same driving distance to the SPIEL as some in Essen. There will be the opportunity to order food and drinks on the premises; a delivery service will take orders at the tables. Teas, coffees and biscuits are free! You would like to come? Contact us by clicking here. We need your full name and home address and also the full names of any friends you want to bring along. You are going to receive a confirmation as soon as you are booked. Registration ends on Saturday, 13.10.2018. This entry was posted in Event by Mellekai. Bookmark the permalink.